In a Tarot card deck, there are four different Queens that have a different suit. These cards have distinct differences and can reveal important messages. The Queen cards deal with femininity, intelligence, and intuition. Having one of these cards can represent a time where we can gain power in a more subtle, non-threatening way. The King card is dominant, assertive and sometimes a little too pushy yet the Queen has just as much control. Each one has a huge amount of power, regardless of what area of your life they represent. When one appears in a reading, it’s telling you to take notice of a situation or a particular individual. Below is a description of each Queen and what advice you can take. 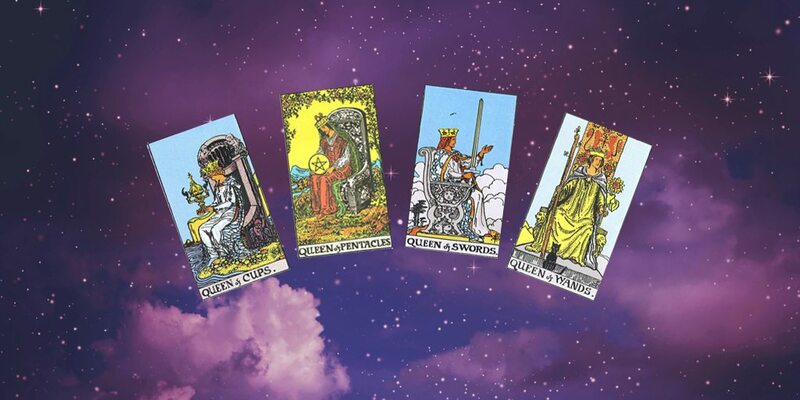 These four Queen cards shown are from the famous Original Rider Waite Tarot Card. If you want to teach yourself Tarot, this deck is available to purchase here and is a great one to start with. A Queen of Cups card represents nurture and great insight. If you get this card in a reading, it’s telling you that it’s time to take care of your emotions. Other people around you might be going through a time of uncertainty. With your heightened insight, you will be able to give great advice that will help. Friends will appreciate this, but it’s also important that you take your own advice on board. You might not realise that you might be neglecting your wellbeing. After you receive this card, make sure you take a step back and dig deep into how you feel. What would make you feel happier in you life? If you take part in activities or spend more time with close friends, you could heal emotional wounds. As a person in your life, the Queen of Cups represents a caring woman who will help you see your potential. She might dedicate extra time helping you through a period of confusion. Even if this female is a friend, you will see her as the Mother Hen in a group. Make sure she is aware of how grateful you are for her guidance. When a Queen of Cups card reversed, this is telling you it’s a time where you will be confused about your finances. Can you not save any money? Are you into your overdraft at the end of the each month? This could be a pattern you are unaware of at the moment. Have a look at small expenses that can add up to damaging figures. Many of us won’t realise that a cup of coffee from a cafe everyday could end up costing a lot. Money is easy to spend so try limiting yourself. Withdraw cash so you are able to keep a better track of physical money. As a person in your life, the Queen of Cups reversed can represent someone who is jealous of you. You’ll be confused about how this started, but you must watch out because it won’t be flattering. Try not to reveal too much about your life to her, just in case she uses it to make you look bad in front of important people. 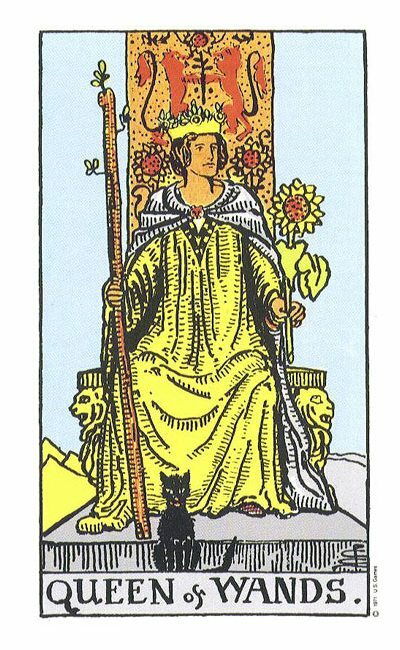 A Queen of Pentacles card represents a time of financial gain which is great news. If you have been struggling, this will begin to ease off. If your job has brought little to no benefits, this is going to change. It’s important that you don’t become impatient if it doesn’t happen as soon as you would like. Make sure you keep up with the positive work so that you don’t appear too entitled. If you are in a relationship, you might receive a wonderful gift off a partner. This could lead to great happiness, especially if it’s unexpected. This could be something you’ve had your eye on for a while or even a trip away. This gift will show how much this person cares about you. 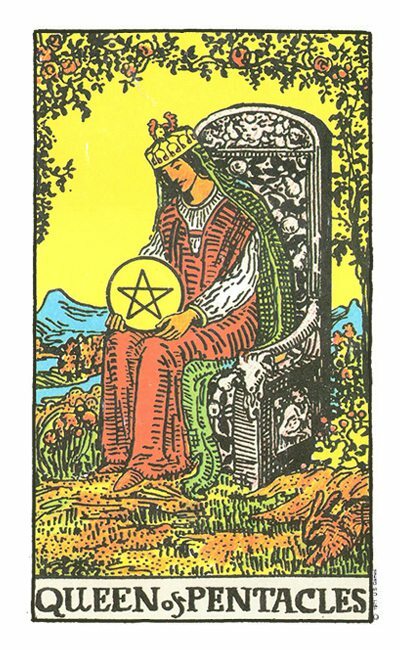 As a person, the Queen of Pentacles is a giving person who emotionally connects with you. She is a character who remains calm, even in the most stressful situations. Her great trait is one that will positively influence you. This person might show you how to stay down to earth during times of frustration. If you see the Queen of Pentacles card reversed, you might start to experience money problems. This isn’t going to be your fault because it will be down to others. If you are thinking about lending a large amount of money to someone, it will tell you to rethink this move. A friend you thought you could trust might take the money yet will take months or even a year to give it back. This Queen will urge you not to give an amount of money away that you’ll desperately need back. If this will affect your finances, you should avoid it. As a person in your life, the Queen of Pentacles reversed is someone that might even lie about money. Do you know exactly what it is going to be used for? If you see them spending it on extravagant items, it will make your blood boil. A housemate might try and guilt-trip you into paying the bigger portion of rent if you earn more money. Try not to let anyone manipulate you and your finances. 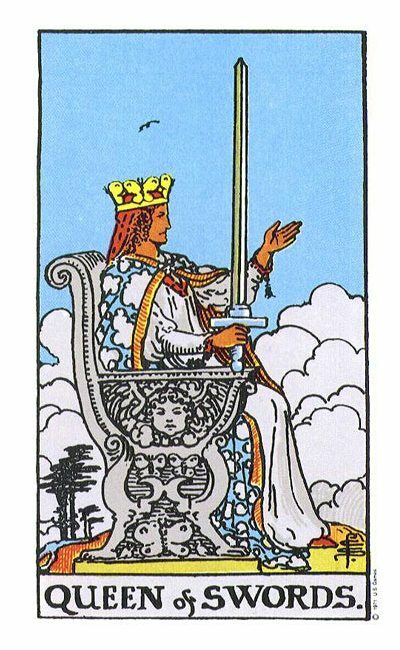 A Queen of Swords card represents a time where you will form an amazing team. If you and a colleague are both struggling with different parts of a job, you might help each other out. It’s likely that this person will come to you and offer their support. This might not be someone you are particularly close to yet, it will be a lovely surprise. Knowing that someone is willing to help you improve is great, so make sure you do the same for them. As a person in your life, the Queen of Swords represents someone who is very intelligent and charming. This is someone who won’t use their charm to manipulate. They will want to protect those around them and make sure team working projects run smoothly. This could be a manager who doesn’t want to step over others to get ahead. Instead, you will see them help others so a business can improve. If you see the Queen of Pentacles card reversed, it means that you will struggle to agree with someone. This might be a negotiation that isn’t going the way you hoped. If you are currently trying to sign a contract to rent a flat, you will need to make sure there aren’t any problems. Check the appliances and the property itself before you sign a contract. Along the line, your landlord might not find a problem important enough to deal with straight away, which could cause a lot of problems. You might even want a raise at work, but the amount offered might not be enough to give you a decent financial boost. Make sure you don’t lose your cool during this time. Being snappy won’t make people want to help you. 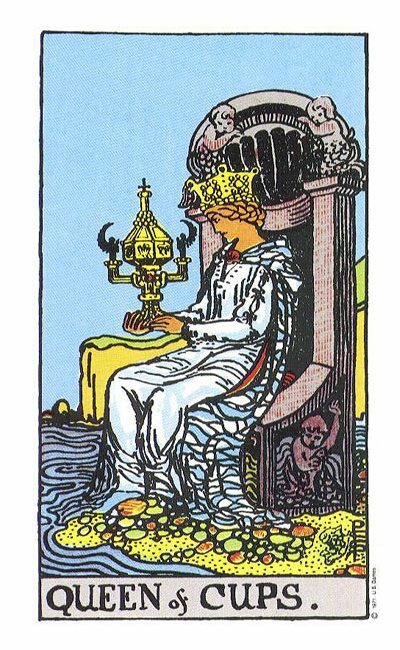 As a person in your life, the Queen of Pentacles reversed is someone who is vain. It’s likely that this person doesn’t care in the slightest about how other people feel. Is there someone who throws insults whenever they want, without thinking of the consequences? This could be an employer who only cares about their financial gain instead of making a team happy. A Queen of Wands card represents a time where you will experience a lot of passion. This desired card means you will be positively influenced by someone around you. This will allow you to boost your creativity and turn projects into a huge success. Luckily, passion can apply to your closest relationships too. Emotional connections with friends will allow you to express exactly who you are. In romantic relationships, you might meet someone perfect. If you are in a relationship already, your spark will be so bright that it will make you feel like new lovers again. As a person in your life, the Queen of Wands will be someone who is naturally creative. They are able to turn problems into solutions effectively. This person will always look on the bright side of life and will inspire you to do the same. After this influence, you will see your life improve step by step. Once you are more positive, you will start to accept more opportunities in life. This change could even lead to a new career path or a move to a new country. If you see the Queen of Wands reversed, it urging you not to bite off more than you can chew. If you have offered to work overtime, you might feel exhausted. This could affect how well you can finish tasks, making you look sloppy. Before you offer your spare time, have a think about whether this is realistic. Will this actually further your career or make it worse? If you already see little gratitude for your efforts, pushing yourself might not be the best idea. Take your time and make sure you work has been finished to a high quality. Be patient and you’ll get the recognition you deserve. As a person in your life, the Queen of Wands reversed is someone who is unreliable. If you are planning a vacation with a friend, make sure you have a backup plan. This friend may have a history of being flaky and backing out last minute which is why you need to prepare. The last thing you want is to lose out on money because of them. Have a plan B and another friend available. Have you ever had a Queen in a reading? If you haven’t had your in-depth tarot card reading yet, visit here today and it could reveal a lot about your future.